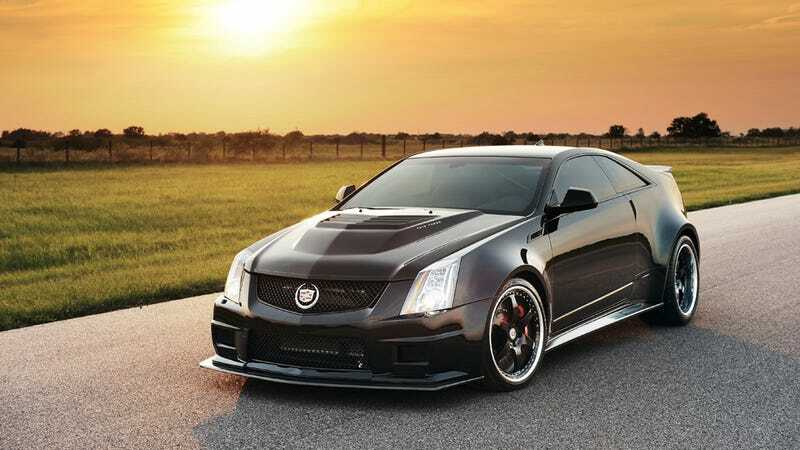 John Hennessey, the Texan who loves to twin turbocharge everything from trucks to custom-built Lotuses, has built a 1,226 horsepower Cadillac CTS-V Coupe. He thinks his operation can outdo the multimillion dollar might that is Bugatti. Last month, outgoing Bugatti CEO Wolfgang Dürheimer told Car and Driver that the upcoming Bugatti Galibier sedan will have over 1,000 horsepower. More importantly to John Hennessey, Dürheimer said that the car will be "faster than anything on the market," and he included tuner cars. To Hennessey, that's a challenge. If Herr Dürheimer wants to invite us to demonstrate the top speed of our 1226 bhp 4-seater (on the VW straight away at Ehra-Lessien), then we would be more than happy to accommodate him. His new VR1200 Twin Turbo kit runs a modified version of the 7 liter V8 in the Venom GT and it puts out 1,226 horsepower and 1,109 lb-ft torque. That gives this CTS-V Coupe a 10.2s run through the quarter mile and a sprint to 60 in 2.9s. Only twelve of these coupes will be made, but John wants to offer the VR1200 upgrade on CTS-V sedans and wagons, too. The coupe sounds like beast on the dyno and we can't wait to see one running the quarter mile and the standing mile. Of course, the best thing possible would be if Bugatti had the balls to take up John's challenge. Just about nobody gets on the Ehra-Lessien track, but we would kill to see this showdown.